The thirty essays in this book, drawn from the scholarly literature, represent major traditional and contemporary scholarship on argument. The essays display the evolution and widening scope of the scholarship in recent decades, as well as tensions among traditional and recent views and emphases. They reflect an array of scholarly perspectives on the values, rules, and conceptual structures that people bring to public deliberation-and that affect how they achieve agreement. The essays also examine argument in various contexts and spheres, with a particular focus on it as a vital, productive means for people to negotiate differences through discussion, especially in a diverse, democratic society. 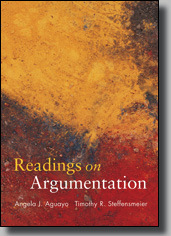 "With a superb blend of classic and cutting edge articles, Readings on Argumentation is an indispensable tool for graduate and undergraduate students studying argument at any level." "I appreciate the volume's focus on judging arguments. This focus will help me address my course goal of considering the role of argument in a diverse society." "For my purposes, the major strength of the book is the wide coverage of primary scholarship. The coverage of topics here is excellent. The organization is very clear and logical." "I especially like the inclusion of legal, scientific, and visual argument articles." "Well organized . . . easy to understand . . . excellent selection of articles." "The list of topics represents the breadth of the field of argumentation. . . . The readings represent some of the key writers in the field." "The major strength of the book is its selection of high-quality articles representing a significant cross-section of the eclectic and interdisciplinary field of argumentation studies." "I really like the collection of essays.... I think the organizational scheme makes sense intuitively and pedagogically." "I found the readings interesting and useful. The sections of the book are thematically unified and address major issues in argumentation theory. The structure of the book is helpful in clarifying and focusing on those issues." "I like very much the way the table of contents divides the study of argument into the three highly relevant questions or sections." "I'd adopt this book in a heartbeat . . . . It would add quite a bit of depth and triangulation (and original authors) to my current book." "I would consider this text. It contains many of the readings I offer in my class and is organized fairly closely to my course." "The major strength of this book is that it collects a number of key readings in one place-organizing them by topic. For someone who does not yet teach an argumentation class . . . this would be a useful set of materials. For someone who already teaches an argumentation class, it might simply be easier to have students purchase the reader than deal with coursepack orders." Angela J. Aguayo is Assistant Professor of Communication Studies at Eastern Illinois University, where she teaches courses in Persuasion and Public Culture, Argumentation, Rhetorics of Resistance, and Documentary Production. She earned her B.A. and M.A. from California State University, Long Beach, and her Ph.D. at University of Texas, Austin. She has published book chapters and essays focused on documentary video discourse as a site of social contestation, protest, and social change. Dr. Aguayo also produces documentary video shorts, which she has screened at several film festivals, including the New York Underground Film Festival and the Cinematexas International Film Festival. Timothy R. Steffensmeier is Assistant Professor of Speech Communication at Kansas State University, where he teaches courses in Communication and Democracy, Rhetorical Criticism, and Classical Rhetoric. He earned his B.A. from Hastings College and his M.A. at Wake Forest University. He earned his Ph.D. at University of Texas, Austin, where he also received the Texas Exes Teaching Award. Dr. Steffensmeier serves as a research associate with the Institute for Civic Discourse and Democracy, an interdisciplinary institute focusing on research, teaching, and extension efforts that facilitate civic discourse. He has published book chapters and essays focused on deliberative democracy, argumentation, and visual rhetoric. These interests inform his scholarship concerning sustainable community development.